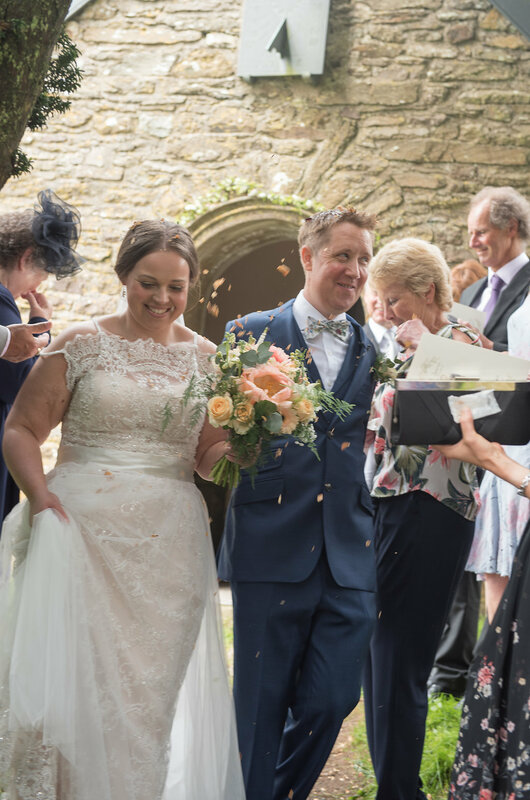 Today I am thrilled to share a gorgeous relaxed rustic Wedding Blessing in Devon with ivory, green, and copper details. 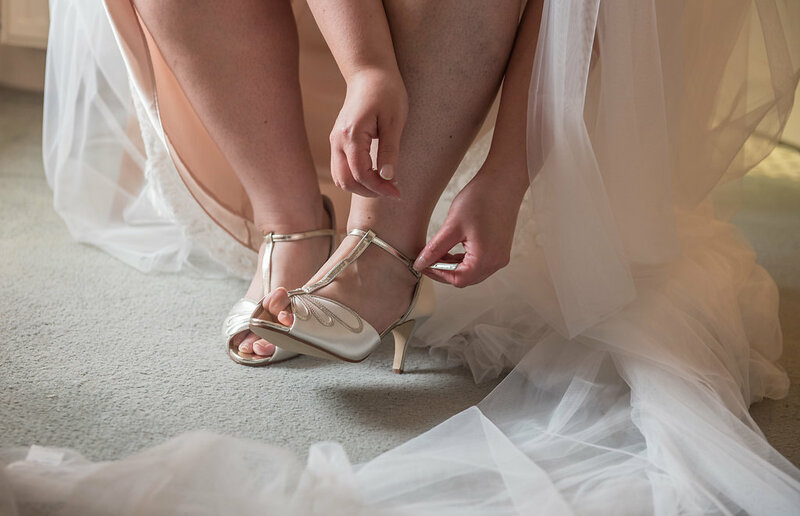 Images were captured by Sarah Jayne Photography. 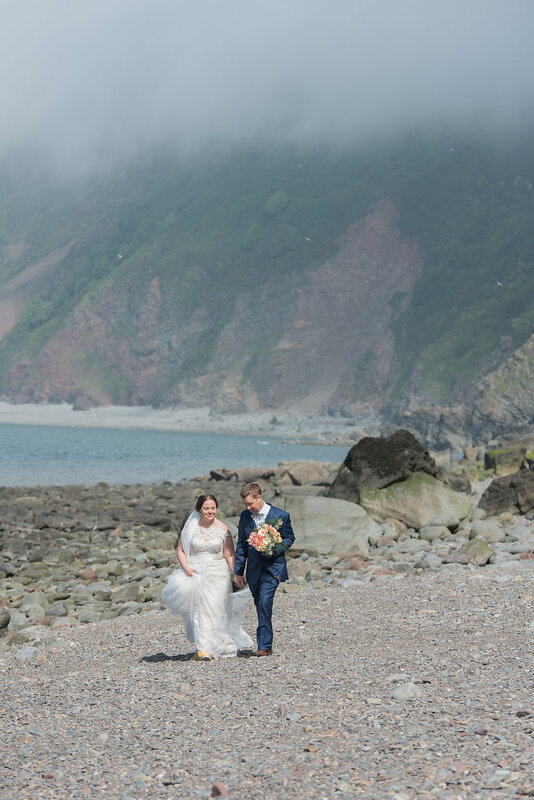 Sarah Jayne is an easy going Wedding, elopement and portrait photographer based In Budleigh Salterton, East Devon. Her style of photography is relaxed documentary, and she blends in as much as possible to capture stories, everything from love, laughs, expressions to tiny details. If there’s a chance to be creative she will be there. She also adores working outdoors with natural light, nature, landscapes, beaches and wide open fields. 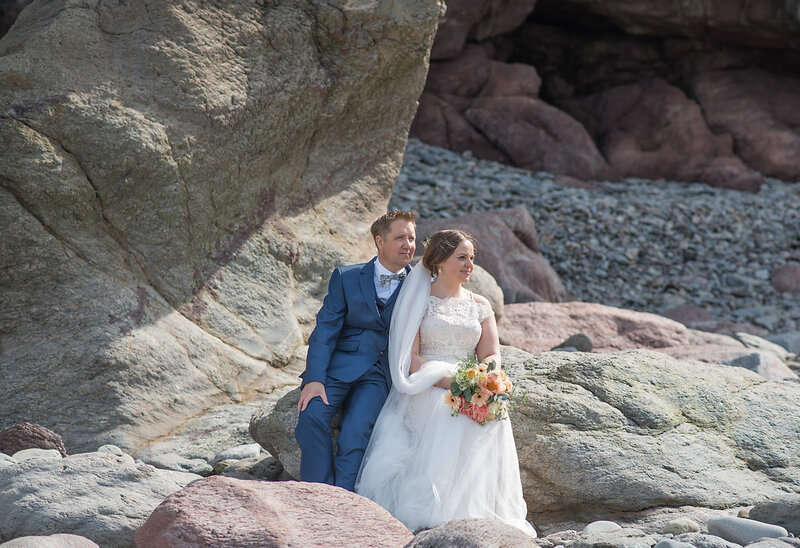 Lawrence and I met through the online dating website, Plenty of Fish in May 2013. I then thought I’ve got nothing to lose, so messaged him. I think I started the message with Hi how are you? (Short and sweet). Lawrence messaged back and a month later we had our first date in Exeter. Two months later we had our first holiday together, camping in Cornwall. After being together for 2 years, getting engaged was something we talked about, and knew that this was something we’d both like to do in the future. I was probably more keen then Lawrence to be honest, and hoped that it would happen sooner than later. We even had a trip to Highclere Castle aka Downton Abbey film location and thought maybe, but to no avail. Then a couple of months later, on the 8th October 2015, we went to Snowdonia for a holiday. 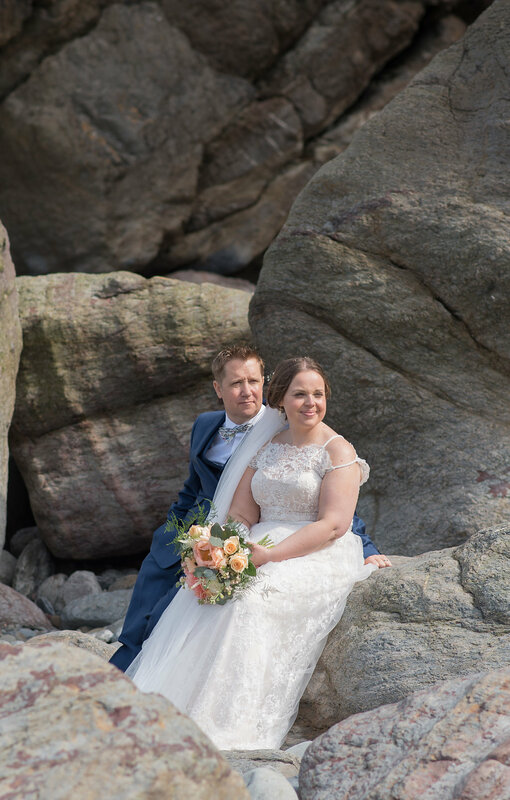 Lawrence and I both enjoy going for a walk and after walking up Tryfan, we sat down near the top and Lawrence asked me to marry him. 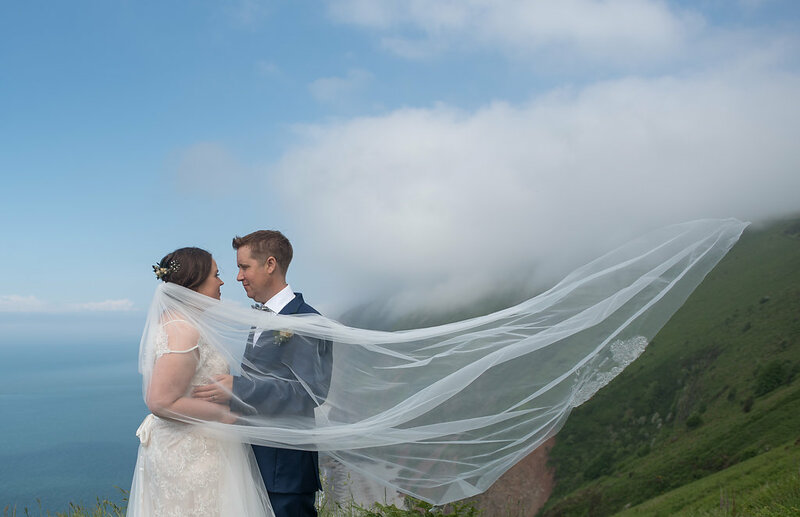 I of course said yes (but sounded more like a scream – not a good idea on a mountain as people instantly think the worst!). Lawrence gave me a Welsh love spoon, which is a Welsh tradition as a token of love. The spoon had a heart for love, a chain linking us together and a bell for marriage. I was so happy, it was perfect. We had 20 months to plan our wedding. 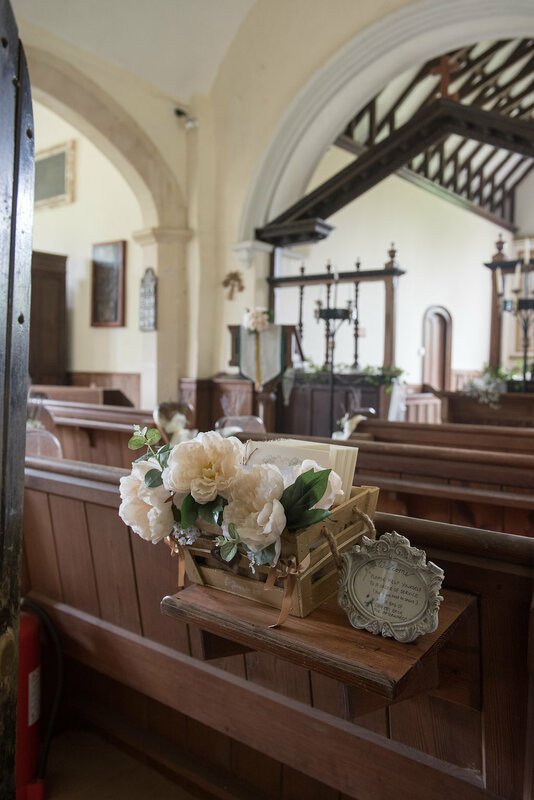 Initially we wanted a church wedding but ended up planning and having a civil wedding, but knew during the planning that we would want to have our marriage blessed at some point. 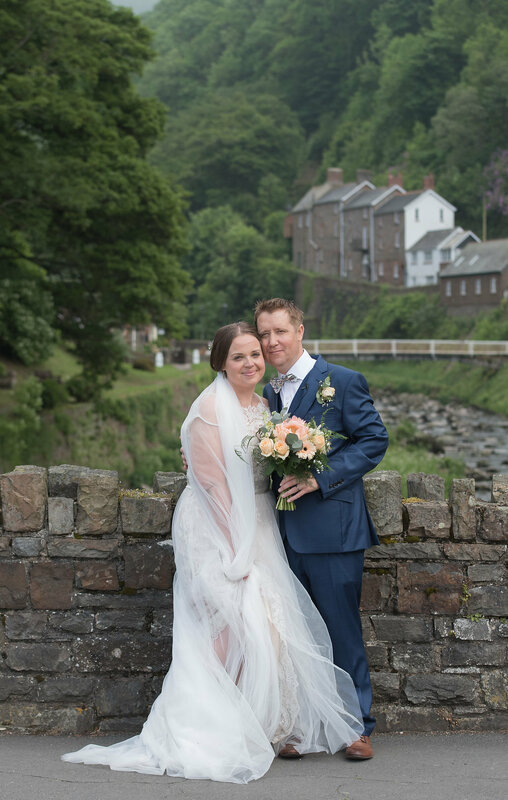 We were married on the 1st June 2017 andhad a lovely day that was shared with close friends and family. 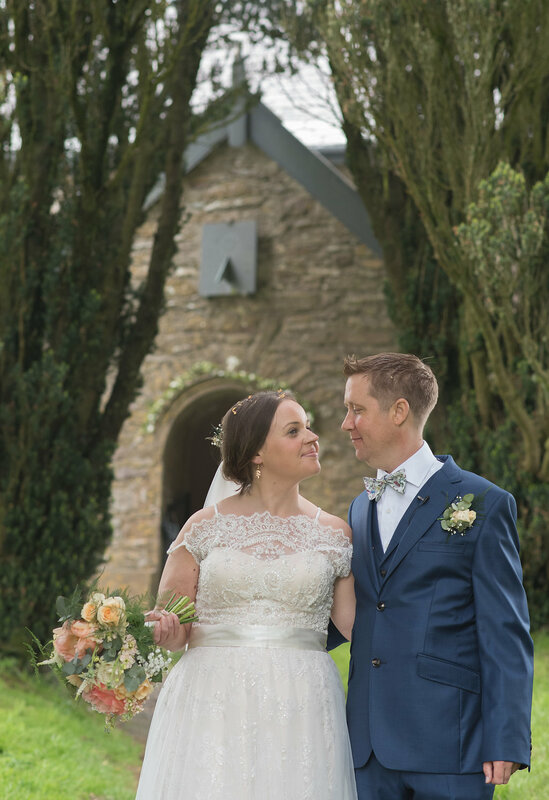 After the wedding we chatted about having our marriage blessed, and after chatting to the vicar of the church, we set the date for the 1st June 2018, our first wedding anniversary. 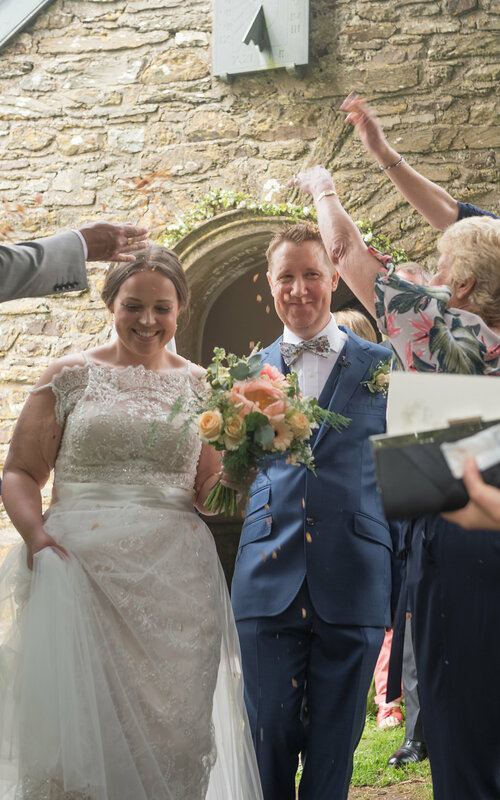 As our wedding had a more glamorous feel, as was in a country hotel, we wanted our wedding blessing to be different and wanted a more relaxed. The location was really important to us too. 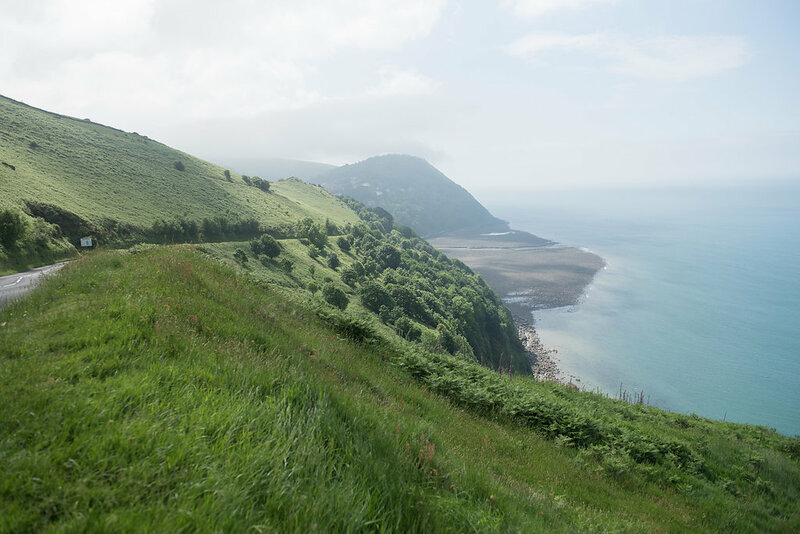 We both love the local area of Lynton and Lynmouth and as a child we would have holidays nearby and Lawrence grew up not far away. 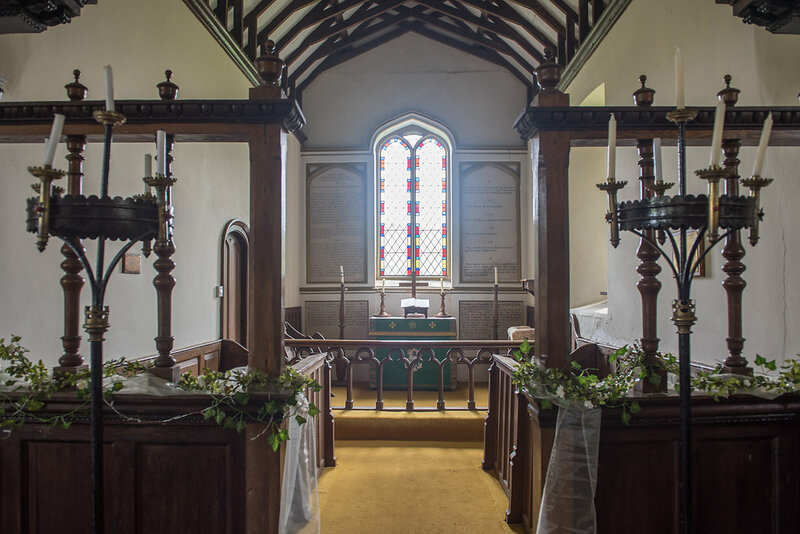 The church is several hundred years old and has a lovely rustic feeling with wooden pews and views of the surrounding fields., and gave the feel of going back in time to a Jane Austin novel. The reception room in the local inn opposite the church is a lovely traditional inn which complimented this. 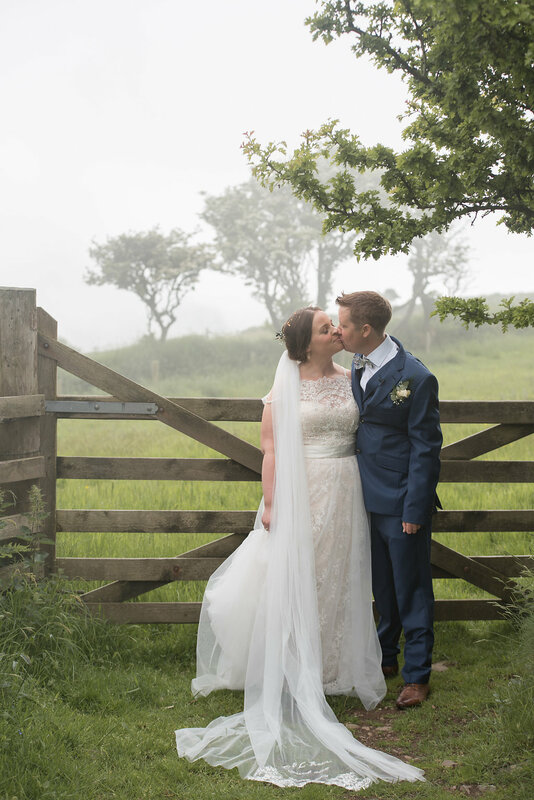 With the rustic theme, we wanted our wedding blessing to be a celebration of our marriage. 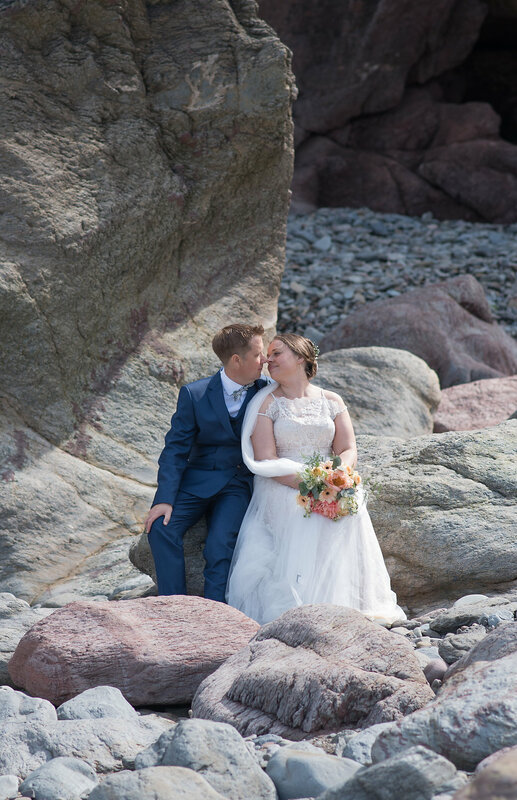 It was a year since we said I Do and wanted to celebrate with friends and family. Our colours for the day was cream, ivory, green, copper and gold. 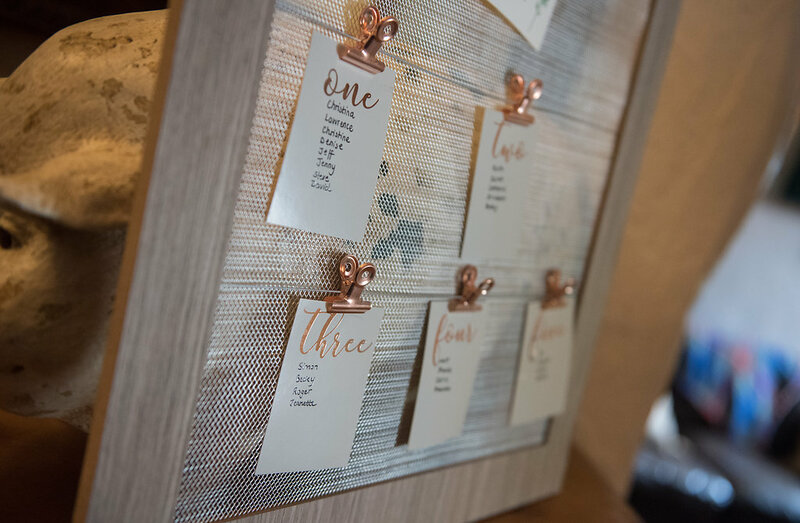 These colours were chosen as were neutral and worked well with both the church and the Inn. 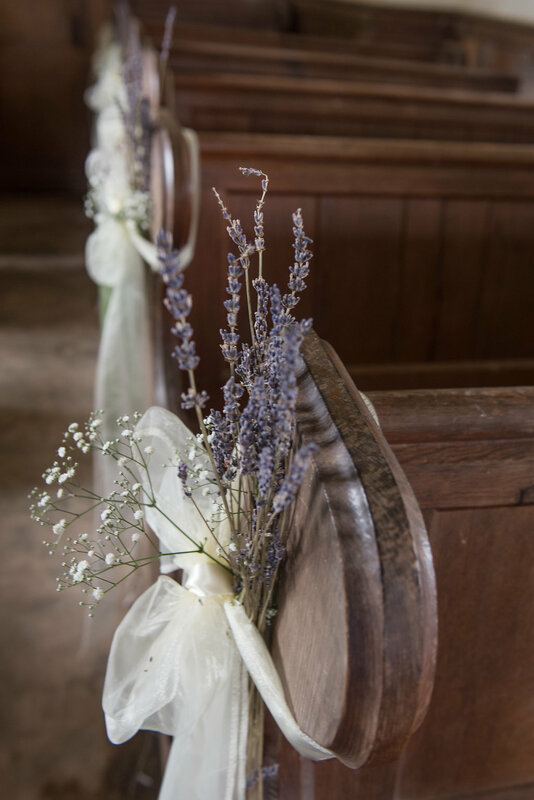 The church was decorated with ivory chair sashes on the pew ends with dry lavender and gypsophelia. I put artificial eucalyptus on the aisle floor with copper lanterns and glass candle holders with battery lit candles. 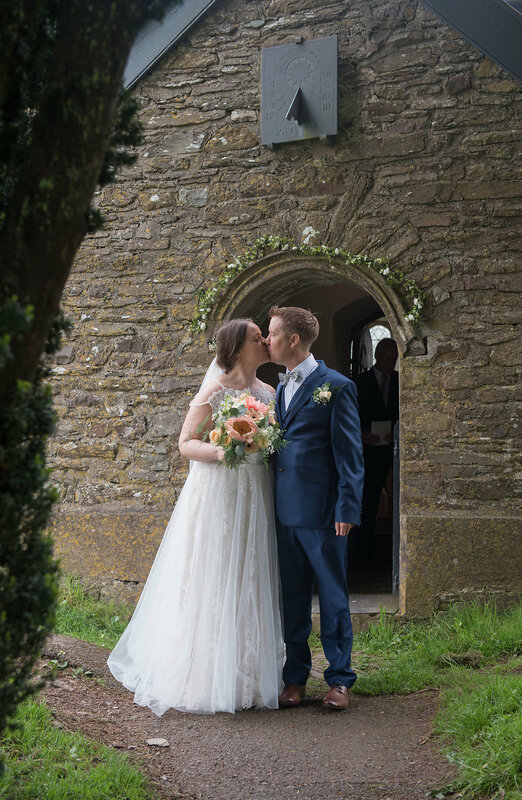 There was also artificial flowers put around the church and outside the church entrance to create a floral arch. I sprayed the flowers with Jo Malone orange blossom, which made the church smell beautiful. The reception room we laid the tables with grey and gold sparkle table runners and had candles in Fentimens glass bottles with fresh flowers on the tables or a large centred candle and artificial eucalyptus. 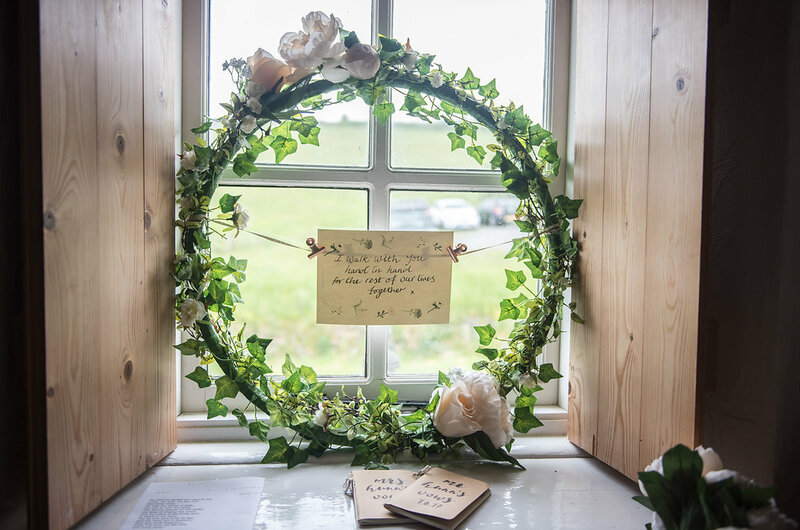 The room was decorated with homemade bunting, including photos of our story and a welcome sign from wildflower illustration company. The ceremony was at 2pm, the same time we was married the previous year. 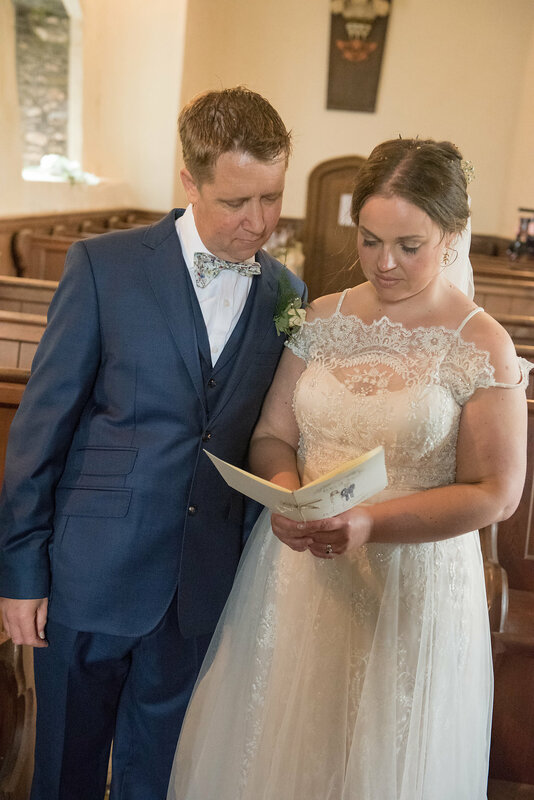 The Reverend Samantha Stayte created a beautiful personalised service for us, including our personalised wedding vows. We walked in together with the music Eternal Source of Light Devine, with the hymns all things bright and beautiful and Jerusalem, and we walked out to Symphony no 1 in B- flat Major. 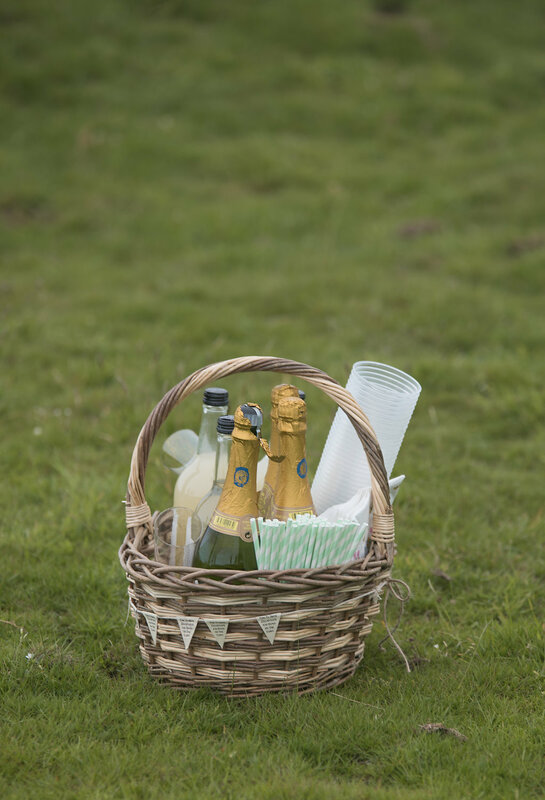 After the ceremony, we had drinks sitting on picnic blankets in the field at the back of the church. 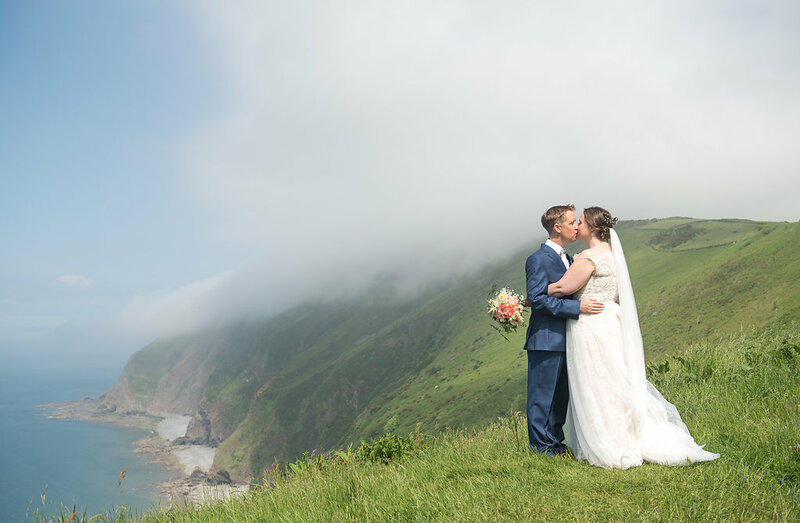 It was lovely catching up with everyone, but despite the low cloud blocking the view, our guests had a lovely time, before going over to the Inn for a meal. We both really enjoyed our wedding blessing service. 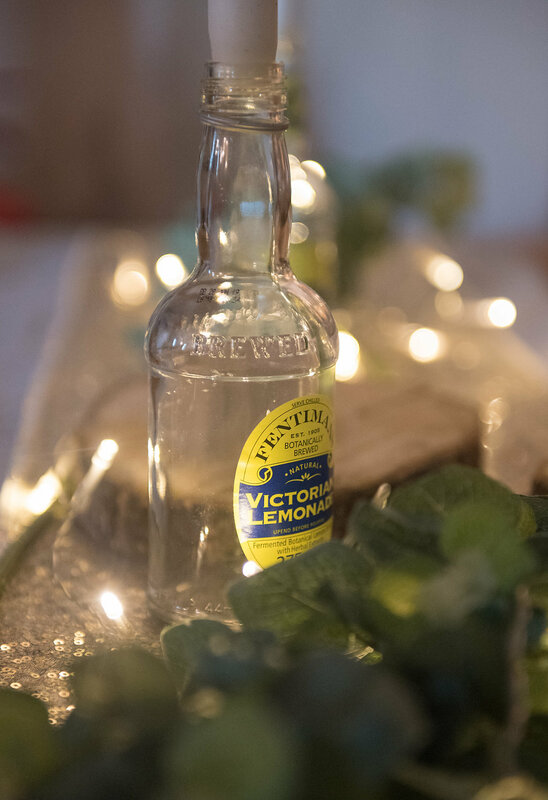 It was the main focus of the day and was lovely to celebrate with friends and family. 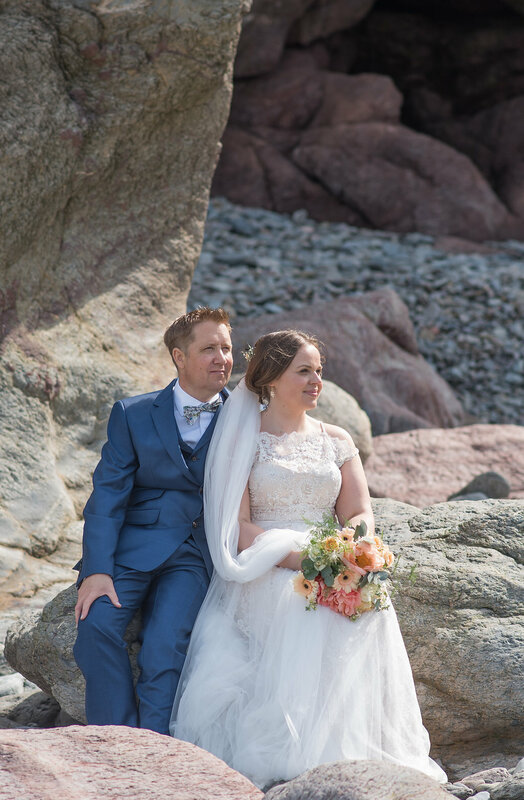 We also enjoyed traveling down the road, where once we was our of the cloud, the sky and sea was a lovely blue with the sun shining and made an amazing backdrop for photos. Make the day yours. It’s your special day and we valued making both our wedding and wedding blessing days about us. 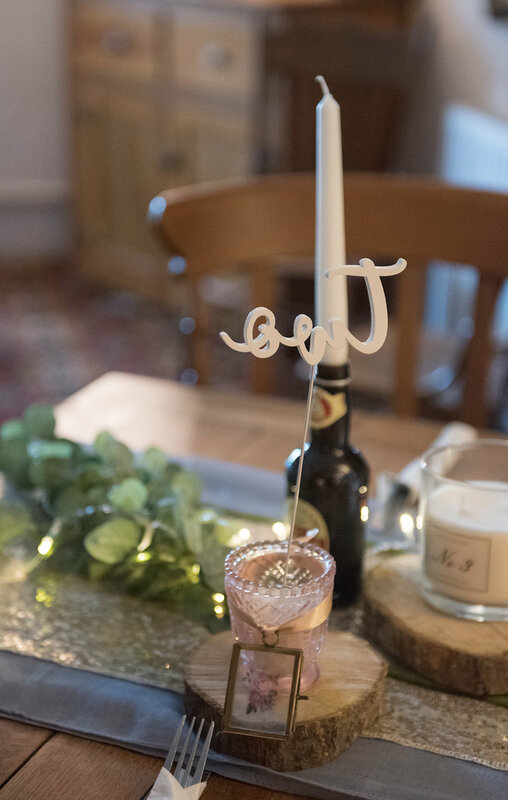 I also created lots of DIY and if you’ve got time, its a great way of saving money and making the venue personal to you. 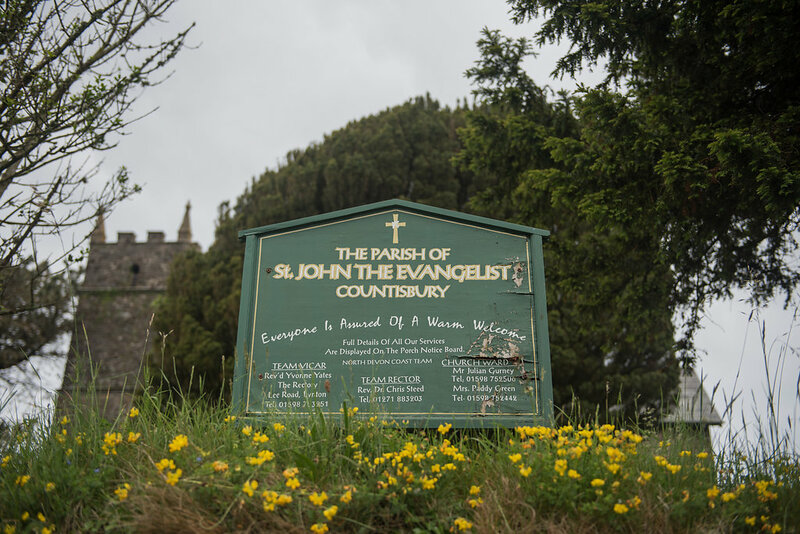 We chose St John the Evangelist Church, Countisbury, Devon as the church we wanted to be blessed in. We had wanted to get married there the year before, but it just didn’t work out. 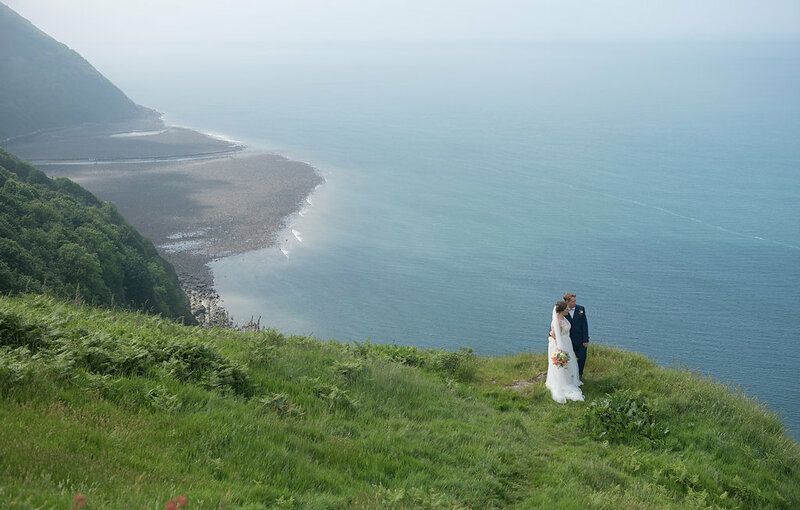 The church is very rustic but has such a charm and full of history, and at the back of the church is the south west coast path which has the most amazing coastal cliff views. You can also see Wales on a clear day. 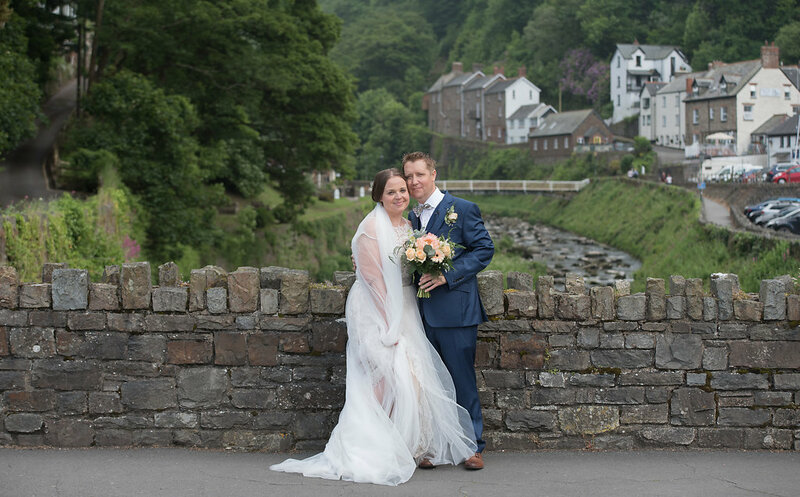 The reception was in the Blue Ball Inn, which is opposite the church. 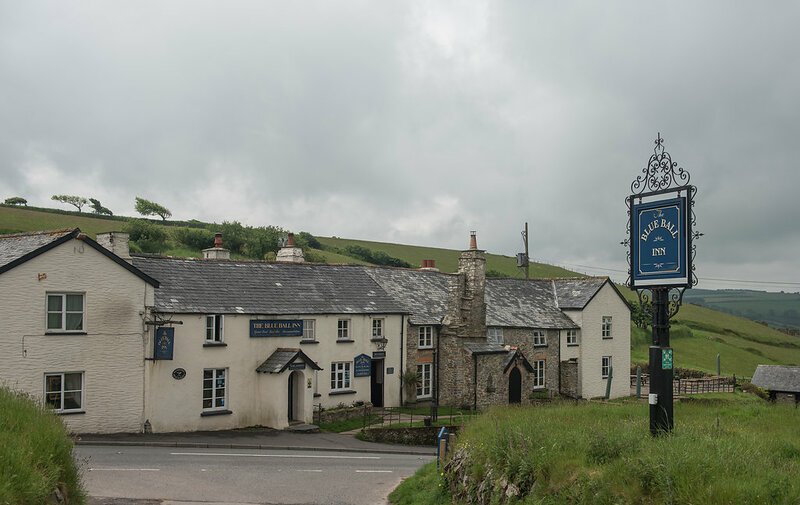 The pub and hotel is so full of charm and the staff are so friendly and accommodating. The pub is somewhere we go for a meal as we love the area and knew this would be the perfect place for us. The food was delicious and guests could chose off the menu what they wanted. We only had 28 guests so this was the ideal choice. 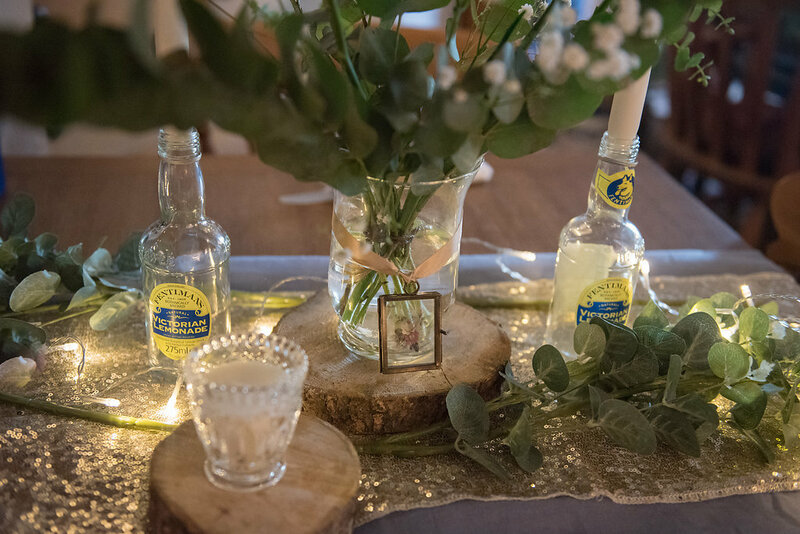 On the morning we decorated the room we were using and guests could mingle in the pub or in the outside grounds. 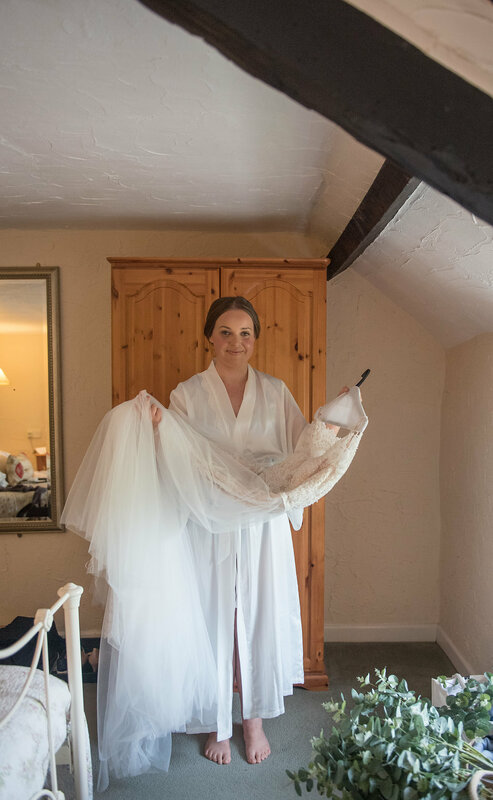 Sarah from the very beginning was lovely to work with and fully understood the type of day we wanted and was able to capture this beautifully. Sarah’s photos we felt captured details so well and were very natural, which we wanted. 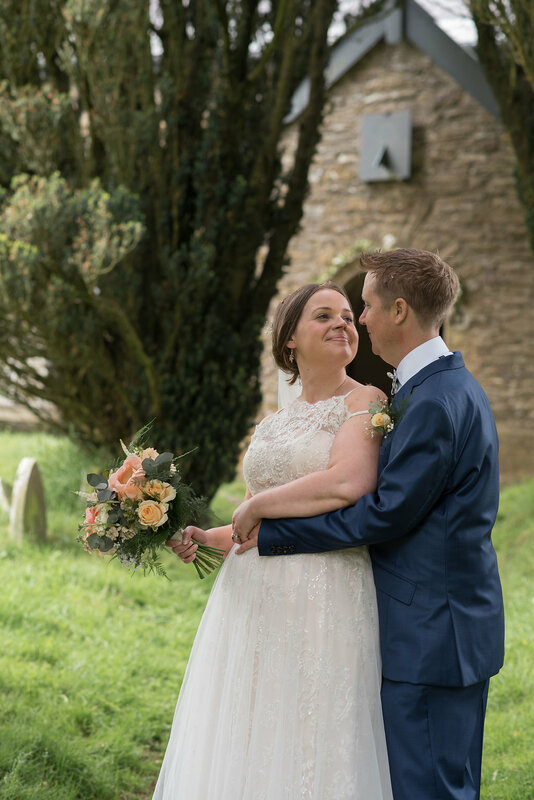 We met Sarah for a couples shoot, on our local common and was so impressed with the photos, couldn’t wait for the wedding blessing. 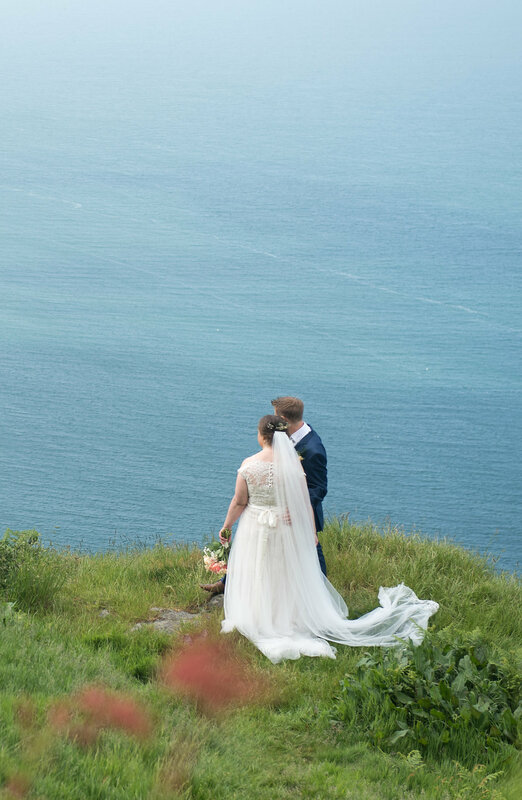 When we got our photos back, we were amazed at how they really captured our day , and had such a wow factor, especially on the cliffs. 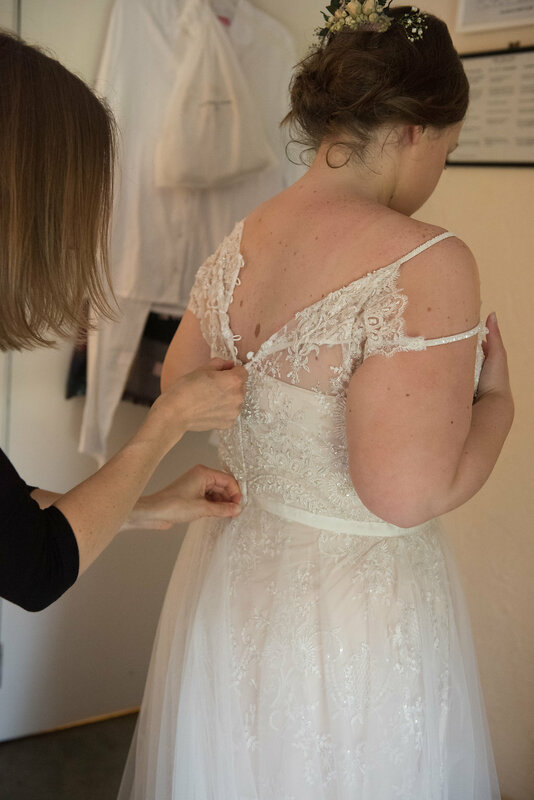 I had initially wanted to wear bridal separates, but Eleanor recommended I try on the Harlow dress and instantly I knew the dress was for me. 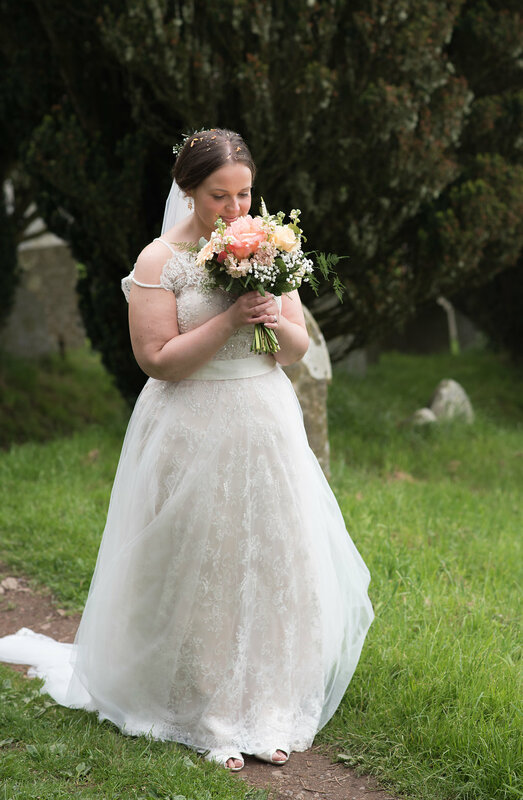 The dress had a vintage Downton Abbey feel and had such beautiful detailing with leaf and floral lace design. It felt so light to wear, which was important as didn’t want to wear a heavy layered dress. Eleanor kindly sewed some finger loops onto the tulle train so I could hold my train easily. This really helped when walking down a cliff for some amazing views of the rugged coast. 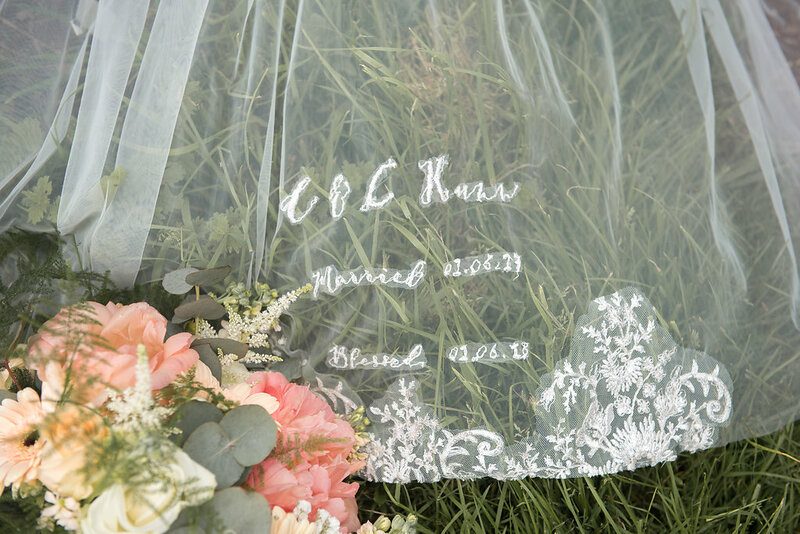 I also wore a ivory chapel length veil and after seeing Megan Markles beautiful embroidered veil, I personalised my veil with our initials and date of our wedding and marriage blessing. 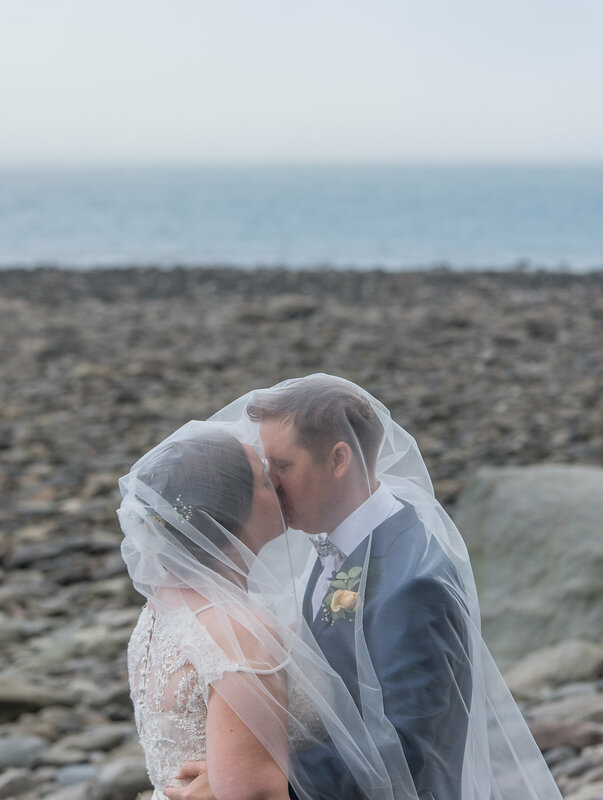 I also hand sewed some lace cut offs from my dress onto the veil, so it all blended in. 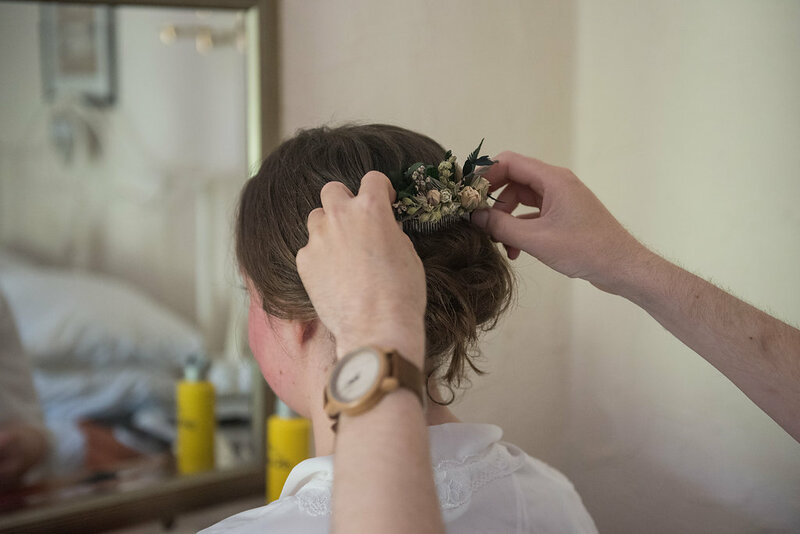 The comb went really well with my dress and was lovely to wear something floral in my hair. 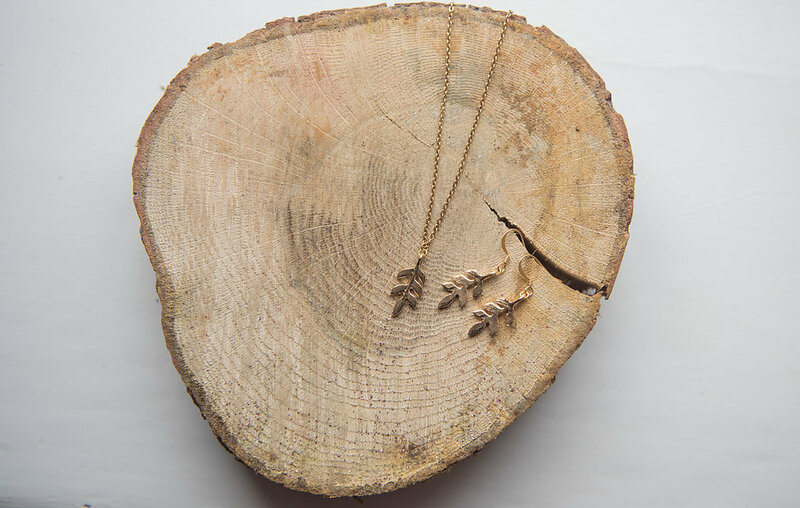 My gold leaf Avani earrings and necklace was a gift from Lawrence, which was purchased from Britten weddings. This matched my dress beautifully. 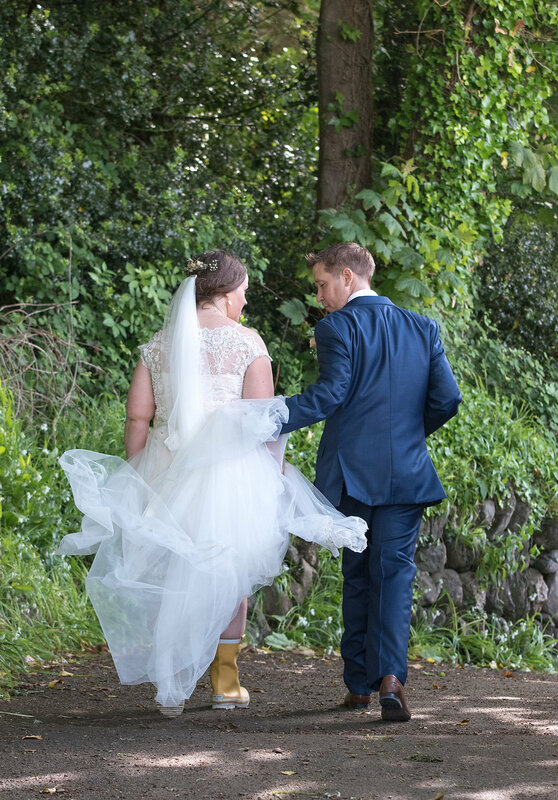 My shoes were ivory T-bar shoes, and were so comfortable to wear, but I did end up wearing my wellies on the cliff and beach as this was a bit easier on the feet! 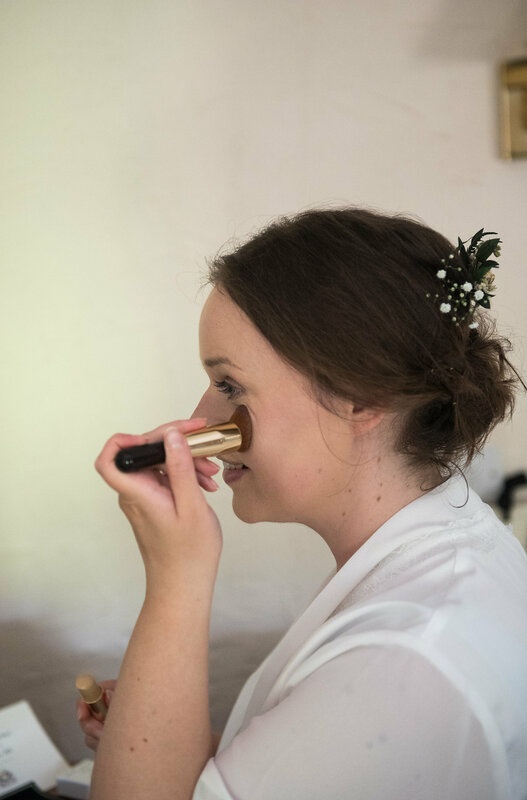 I wore Jo Malone Orange blossom body crème and wild blue bell cologne, which when I wear now brings back wonderful memories of both special days. 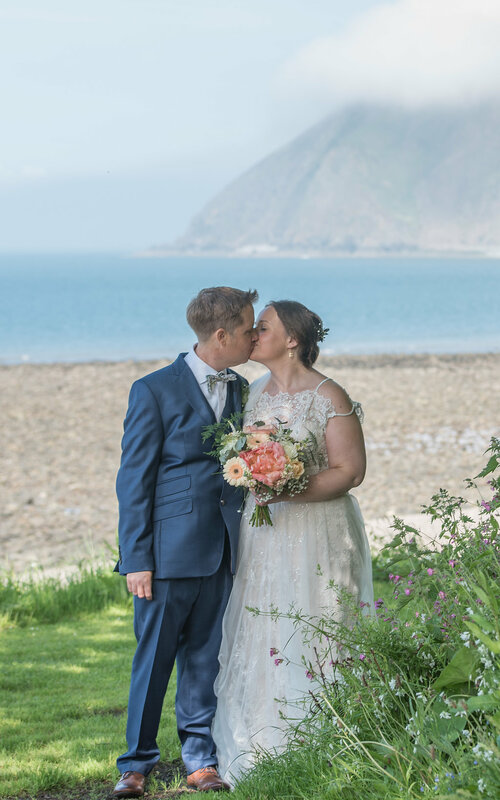 Lawrence wore a blue 3 piece suit from Ted Baker, purchased from Debenhams and a white shirt from TK Maxx and brown shoes from Clarks. 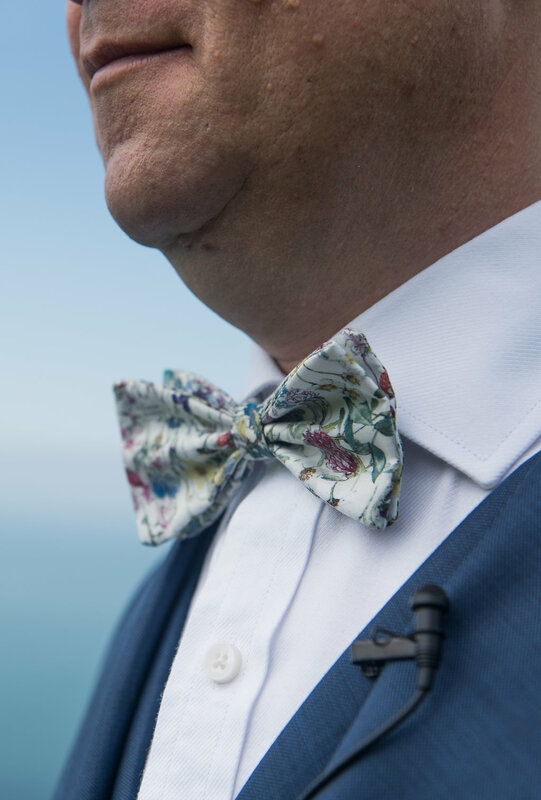 Lawrence bow tie was purchased from Catkin Jane, as a gift. 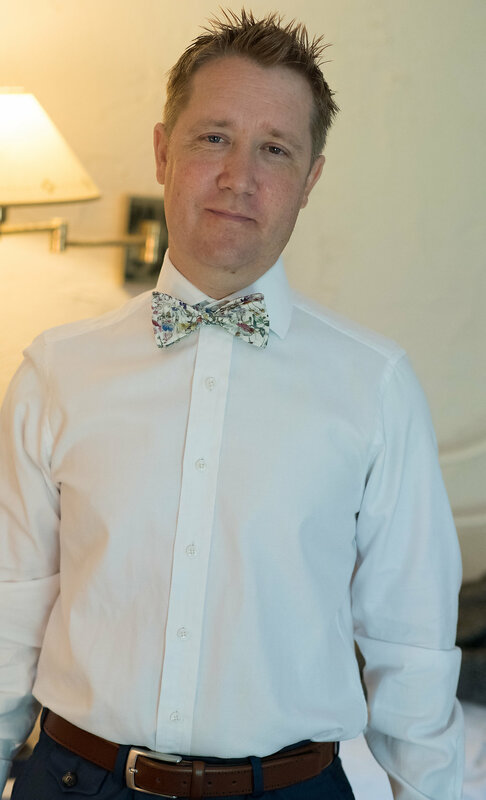 Lawrence never wears a bow tie and thought this would be a lovely gift for the day. We had a 2 tier white iced sponge cake. The bottom tier was Victoria sponge and the top tier was chocolate sponge. The cake was yummy and received great feedback from guests on how much they enjoyed the cake. 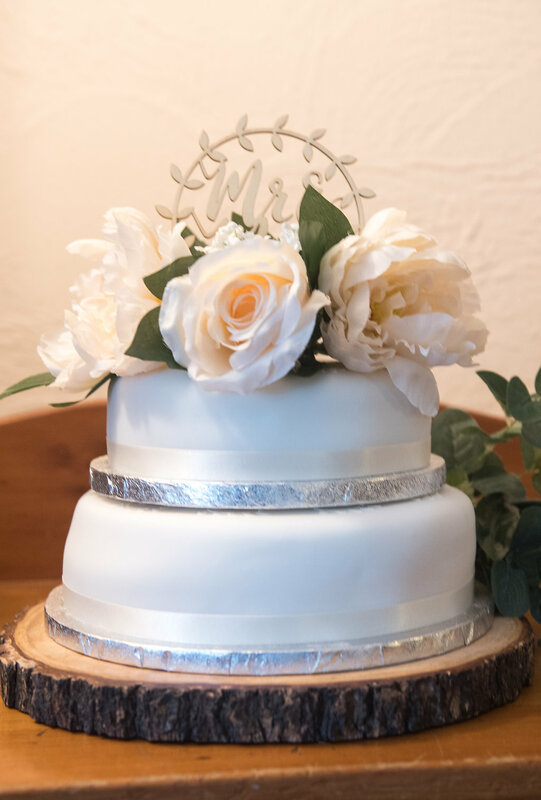 I decorated the cake with artificial flowers and eucalyptus from The Range and the cake topper was a online purchase. 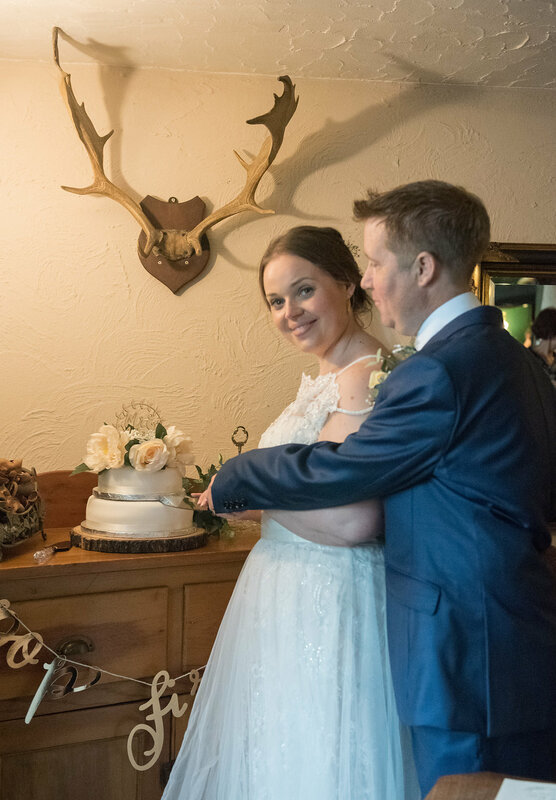 We were really pleased with cake and for those on a budget, I can highly recommend wedding cakes from Marks and Spencer. 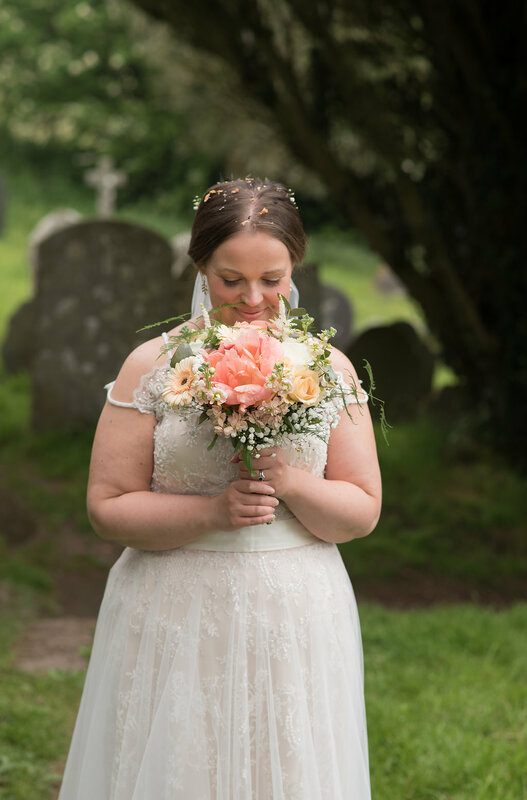 Liz was our florist from our wedding, so I had no hesitation with booking her again. She made me a beautiful floral bouquet and button hole for Lawrence. 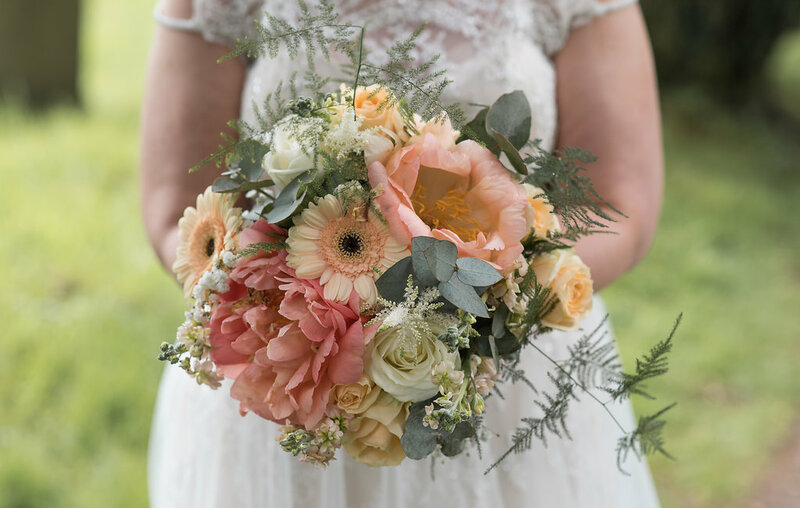 I let Liz choose the flowers, which included peonies, roses and fern. 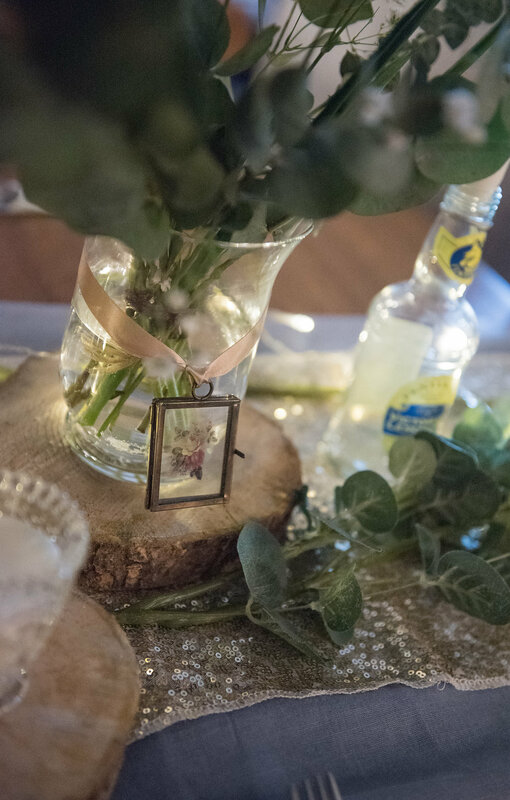 For the reception we had eucalyptus, gypsophelia and a white rose and freesia. Lawrence’s nan passed away recently, and freesia was one of her favourite flowers, so we decided to incorporate this into our arrangements. 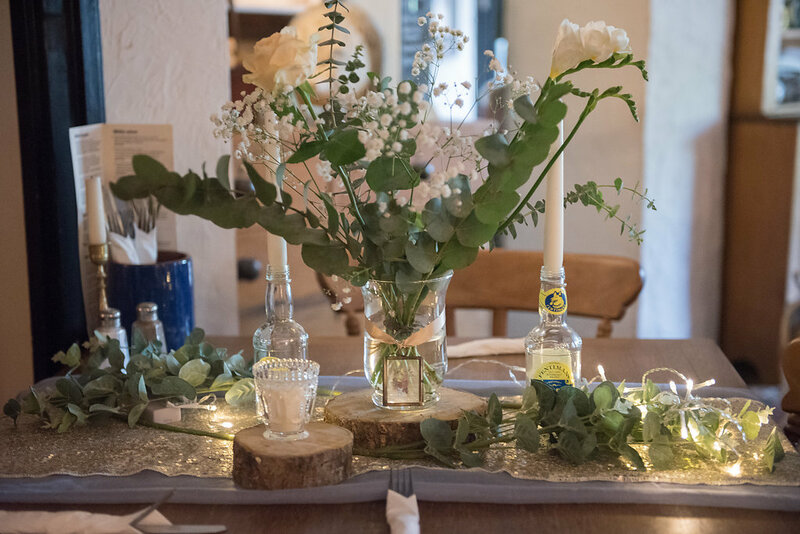 We also had artificial eucalyptus and cream flowers from The Range on the tables and around the venue, including a floral hoop that I made. 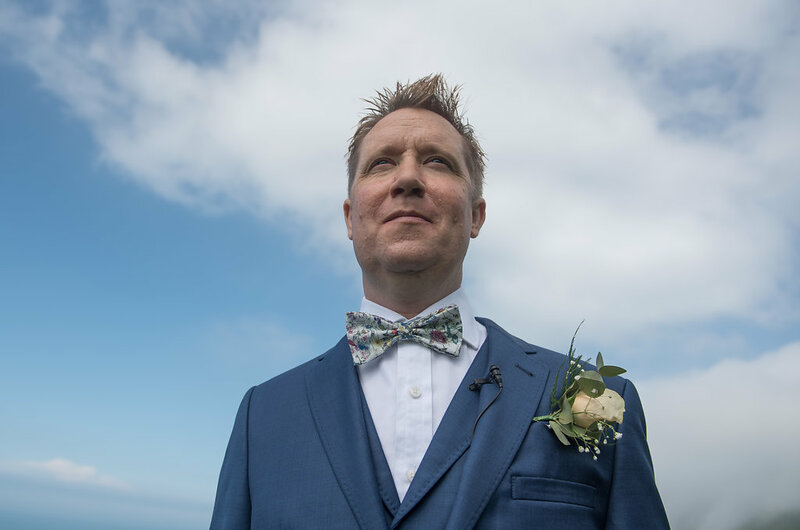 We really liked Tommy’s cinematography wedding videos on his website and knew he would capture our day beautifully. 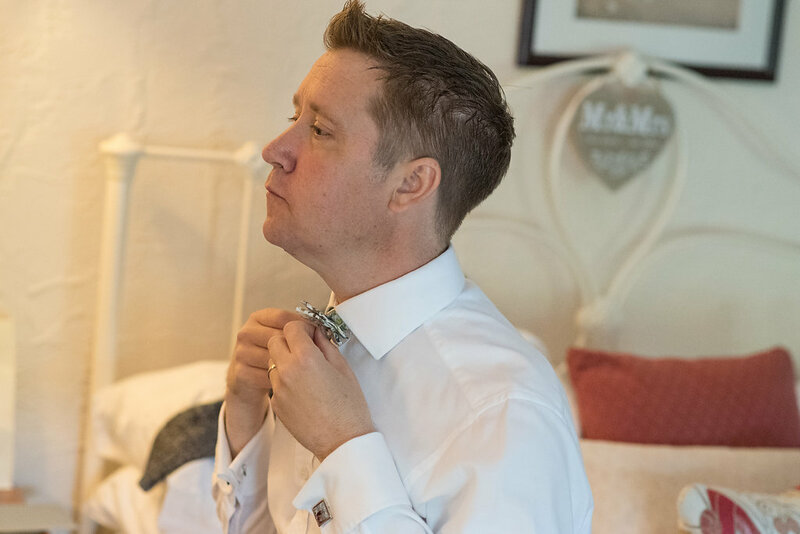 He was great to work with on the day and are looking forward to getting our video and remembering our special day again. Lawrence and I chose my engagement ring together. It’s a beautiful sapphire and diamond ring and similar to the Duchess of Cambridge’s, but on a much smaller scale! 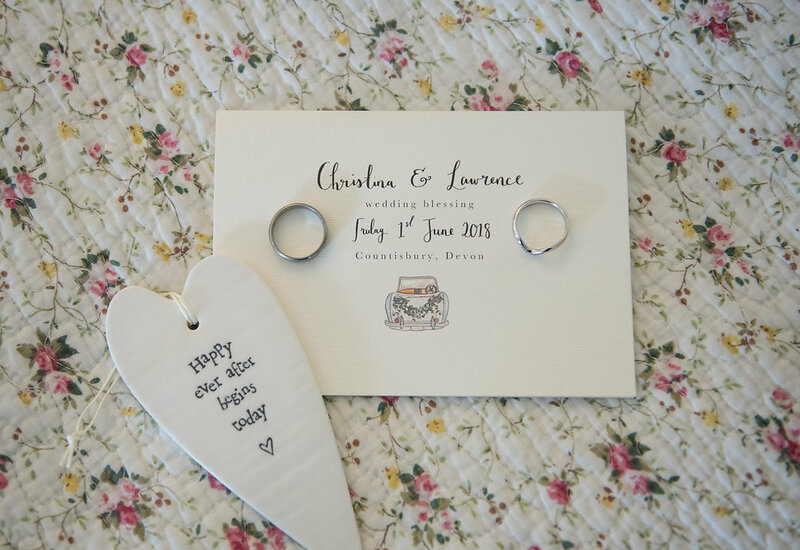 Our wedding rings were bespoke from Prism Design based near Bath. I struggled to find a ring that would fit my engagement ring. Prism created a white gold shaped ring with diamonds set in and Lawrence had a titanium ring, as he wanted something hard wearing. I was the stylist and wedding planner. 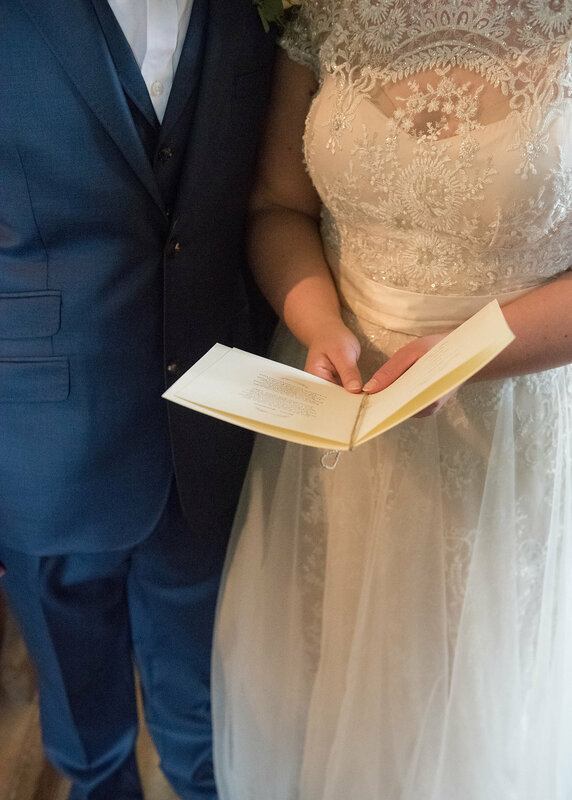 I thought with organising our wedding and reading magazines and wedding blogs, I’d be able to organise our wedding blessing. I really enjoyed doing this and was pleased with how the day turned out, which was special for us. 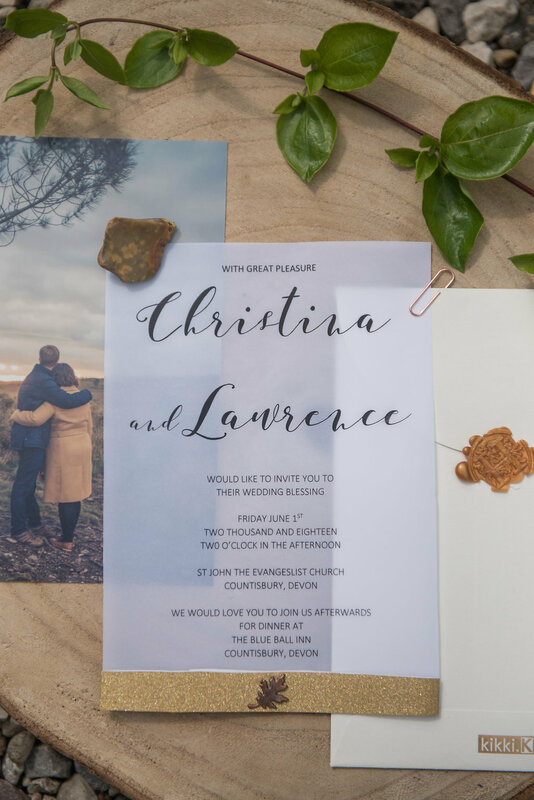 I created our invites using a free online template, which I altered to make it more personal. I also bought invites from Kikki.K Stationery, which I used as our details page. 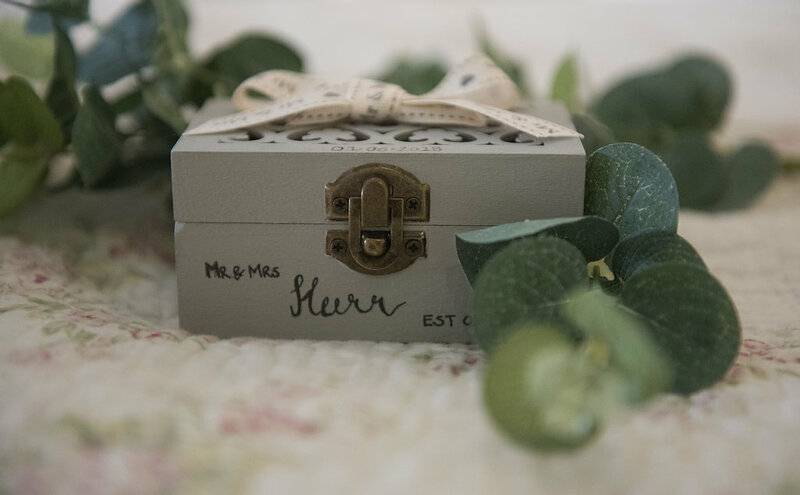 Each invite had a photo from our couples photo shoot and was tied together with a gold belly band and leaf press stud and sealed with a H.. 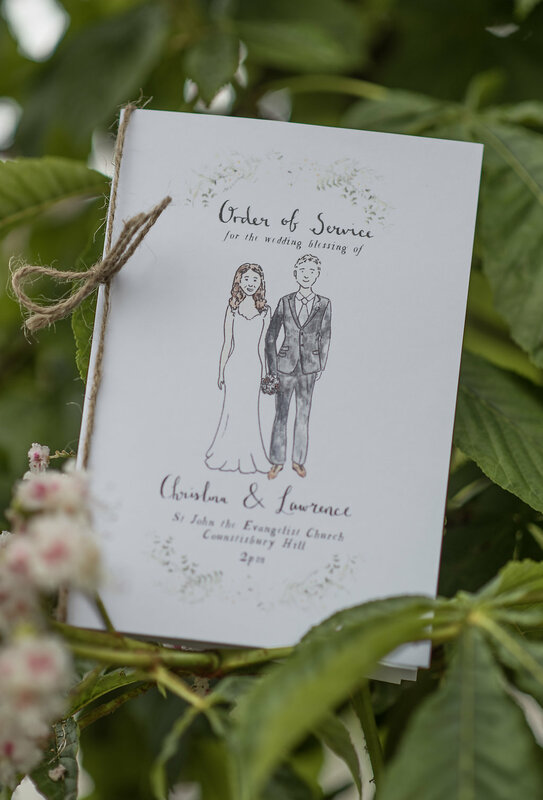 The order of service and welcome signs was created by Wildflower Illustration Company. 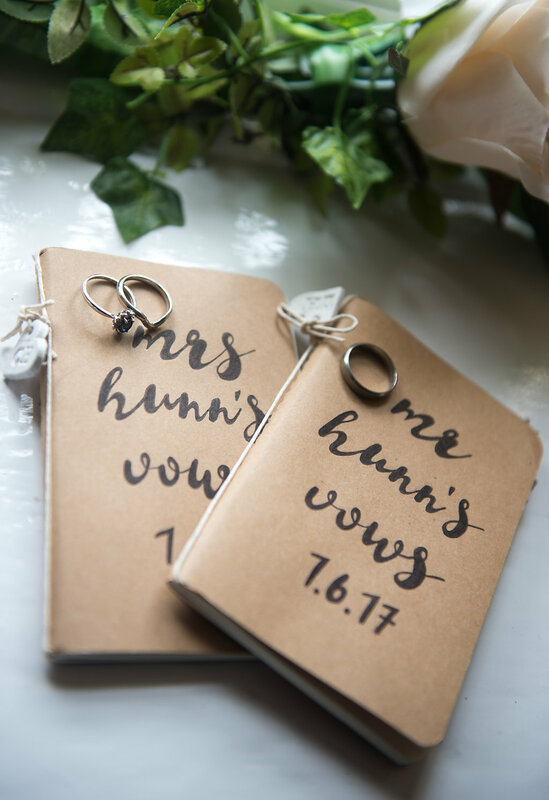 They create the most beautiful stationary and were great to work with. I did my own hair and make up. It was a goal of mine to do and was really pleased that I did. I had make up lessons with Bobbi Brown and bought make up from them. 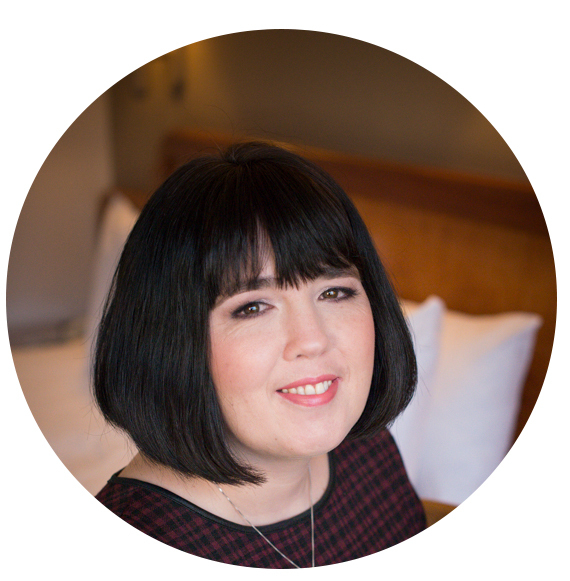 My lipstick was Charlotte Tilbury Penelope pink as just love the colour. For my hair I decided to have it up, despite initially wanting my hair down. I watched a video on you tube on styling short hair. My hair actually took longer to do and hair spray is a must!